The Magnesphere helps Spa's bring "Well" into their Wellness Program. A one-of-a-kind platform that's part of the trend of integrating wellness and technology is set to become a valuable part of the spa industry. The Magnesphere™ from Magneceutical Health™ offers a whole-body immersion utilizing precise, low-level electromagnetic fields to enhance feelings of relaxation, which helps address chronic stress and its primary symptoms of pain, inflammation, digestive issues and sleep disorders. The technology is pain-free, drug-free and will officially enter the spa market in September during the 2016 ISPA Conference & Expo in Las Vegas. All media are invited to stop by the Magneceutical Health booth (#244) and experience the service in person at the ISPA Conference & Expo, Sept. 13-15 in Las Vegas. More information may be found on http://www.Magneceutical.com. 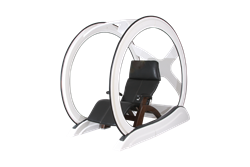 About Magneceutical Health - Led by Allen Braswell and Dr. Jerry Jacobson, the Magnesphere™ was designed to help people improve their health and wellness by enhancing the relaxation response through the use of natural and holistic magnetic fields. The Magneceutical Health team creates products to help people manage stress, strains and pain without drugs, shots, or surgery. More on http://www.Magneceutical.com.